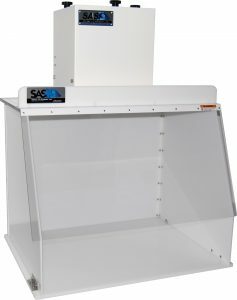 Laboratory fume hoods provide operator and environmental protection from hazardous fumes, particulate, and other gases. Through inhalation, harmful fumes directly enter the blood stream and small particles may become embedded deep within the lungs (Ref. 1). 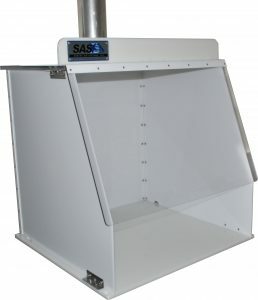 A laboratory fume hood reduces exposure by containing the fumes and particulate dispersed during an experiment and a powerful fan diverts the airflow into a filter chamber or into external ductwork to be released outside the building. Ductless models filter the air releasing it back into the external room. By filtering the air, ductless fume hoods also provide environmental safety by removing harmful fumes before releasing the air back into the room. When to use a fume hood? Other components of the experiment should be considered for the use of a laboratory fume hood, such as the procedure, probability of release of gases, the number and complexity of manipulations, and the skill level of the operator (Ref. 4). Experiments should be designed to utilize laboratory fume hoods when necessary. Laboratory fume hoods should not be employed for biological agents or highly toxic materials (Ref. 5). Studies with biological agents, such as low to moderate risk pathogens and harmful microorganisms, must operate under portable clean rooms to protect contamination to the process. Comparatively, experiments with highly toxic materials must be completed with glove boxes to provide extra safety to the operator (Ref. 4). Proper usage of laboratory fume hoods protects the operator from respiratory exposure which may cause long-term harmful side effects. This chart below details the possible health effects from respiratory exposure for sample chemicals that are advised to be used under a laboratory fume hood. Please notice that many of the chemicals listed have OSHA permissible exposure limits (PELs) which OSHA legally requires employers follow for all employees. 35 mg/m3 Sinusitis, upper airway irritation, and eye irritation, severe injury or death. 30 mg/m3 Irritation to skin, eyes, and mucous membranes, severe injury, burns or death. • Environmental Protection – By filtering and removing contaminants from the air, the system prevents harmful pollutants release into the atmosphere. • No Makeup Air Required – Ductless fume hoods filter the air and release it back into the room. 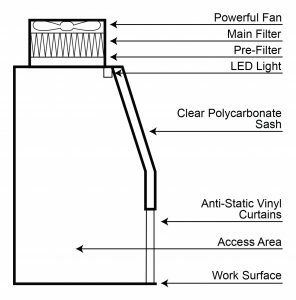 This recirculation pattern eliminates the need to add makeup air, which is required with ducted fume hoods. • Energy Efficient – Due to the recirculating design, ductless fume hoods save energy by not wasting climate controlled air. 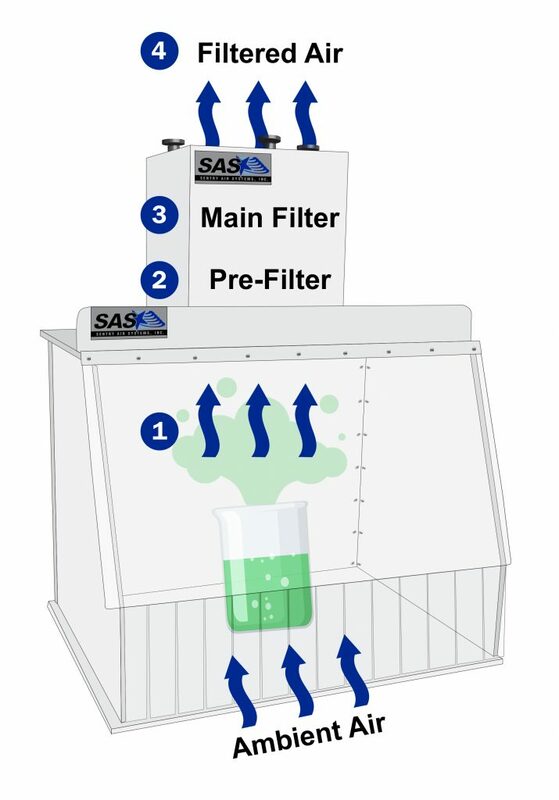 • Minimal Maintenance – These dependable and reliable units only need regular filter maintenance for replacing saturated filters and regular cleaning to remove spills or residue. • Simple Installation – Because of the lack of expensive external ductwork, ductless fume hoods offer “plug and play” solutions without costly installation. 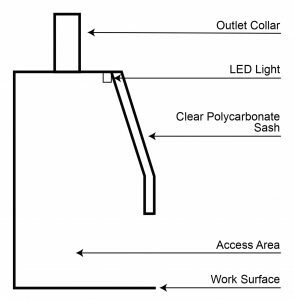 See diagrams below for components of ductless and ducted laboratory fume hoods. The magnehelic gage measures the static pressure of the filter to help monitor the filter saturation. As the filter becomes more saturated, the pressure will increase and the gage will move up. After a certain point, the filter must be changed to ensure proper filtration and protection. The variable speed control allows the operator to adjust the fan speed based on parameters of the experiment. The outlet collar connects to the external ductwork and fan system. The fan draws the fumes and particulate from under the hood through the outlet collar and external ductwork to be released outside of the building. 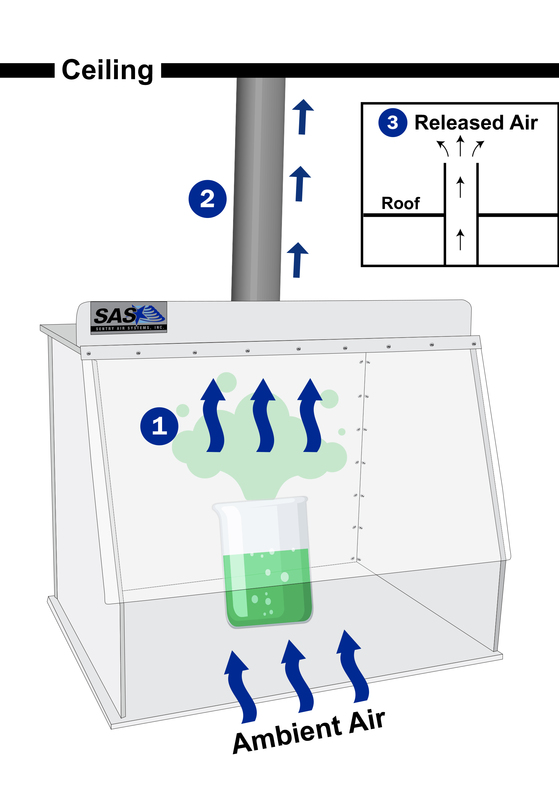 The sash on a laboratory fume hood helps determine the airflow characteristics and controls the air velocity to adequately capture chemical vapors and particulate (Ref. 3). Spill trays help prevent the spread of chemicals when spills or accidents occur during an experiment. Spill trays are an accessory and would be placed on the work surface as needed. How do Laboratory Fume Hoods work? Operator performs the process or experiment within the hood behind the sash to contain harmful fumes and particulate, preventing them from emitting into the ambient air. The powerful fan, located on top of the hood, draws in the fumes and particulate along with ambient air into the filter chamber. A pre-filter processes the air captures some of the particles. The main filter processes the air in which the efficiency depends on the type of filter utilized (HEPA, ULPA, ASHRAE, Activated Carbon, or Specialty Blended). 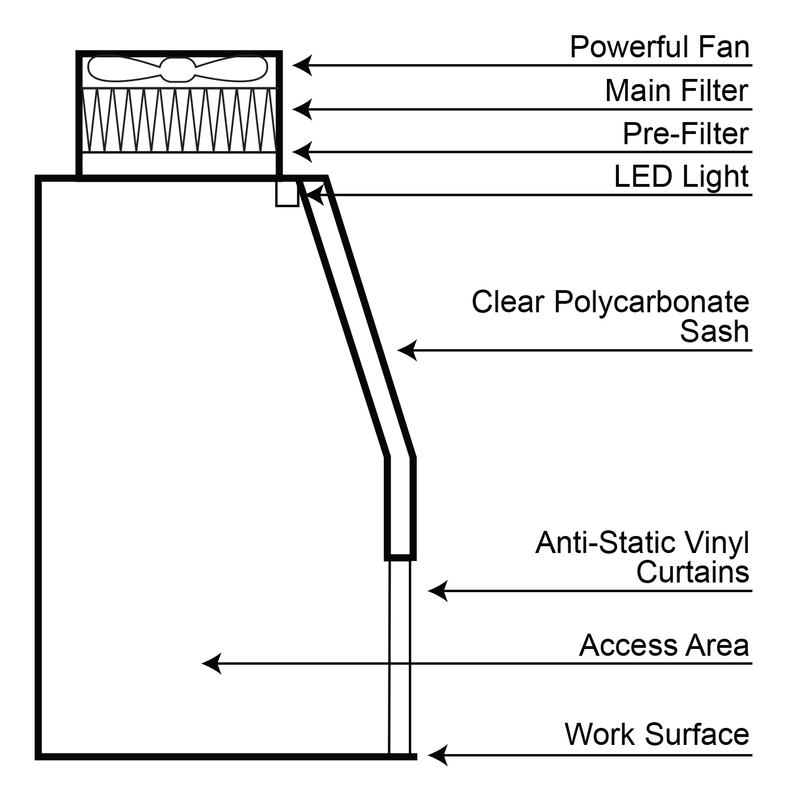 The system releases the filtered air back into the room eliminating the need for duct work. Operator conducts the process or experiment in the hood behind the sash to avoid exposure of harmful fumes and particulate. A powerful fan draws air through the outlet collar into external ductwork. The system exhausts air to outside the building preventing operators from breathing harmful fumes and particulate. To ensure protection from harmful chemical vapors and fumes, proper safety procedures must be implemented in the lab while using a laboratory fume hood. • Always make sure the laboratory fume hood is operating correctly before beginning the procedure (Ref. 1). • Proper safety gear must be worn at all times including safety goggles, lab coats, and chemical safe gloves (Ref. 11). • Keep face and heat outside of the sash at all times and limit the amount of time that hands and arms are working inside the sash (Ref. 1). • Only keep necessary materials within the laboratory fume hood. Never use it for storage and keep the area from overcrowding for proper use (Ref. 1). • Keep all materials 6” (15 cm) within the hood to properly vent fumes and prevent seepage (Ref. 3). • Minimize outside air flow by closing windows and doors as well as reducing traffic in front of the laboratory fume hood (Ref. 11). • Only remove hazardous chemicals from the laboratory fume hood once the storage container is fully closed (Ref. 4). 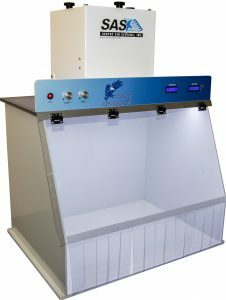 The latest in ductless fume hood technology, the AirHawk offers a user-friendly control panel complete with adjustable light and fan controls with digital displays for air pressure and runtime. The AirHawk features a 1400 LUX LED light, the brightest in the fume hood industry, providing superior visibility with an adjustable control. The adjustable fan control allows the operator to vary the fan speed and make note of settings to optimize experimental conditions. The air pressure digital display uses a precision solid-state pressure sensor to measure the static pressure on the particulate filters. Over time as the filter becomes saturated, the air pressure display will increase and once it reaches a certain pressure the filter will need to be changed. The runtime digital display shows in hours how long the hood has been in use. This feature will help with filter maintenance schedules with the ability to reset after filter replacement. The AirHawk provides both operator and environmental safety with helpful technological features to aide in everyday laboratory work. Standard sizes of the AirHawk available are 30”, 40” and 50” with in between sizes available made custom. The standard ductless fume hoods offer all the benefits of a ductless unit in a simple, practical and economical package. These self-contained circulating respiratory protection devices come in a wide variety of sizes: 12”, 18”, 24”, 30”, 40”, 50”, 60” and 70”. The 40” and 70” models are available with high flow capabilities. The standard ductless fume hood comes with a variable speed controller (115 V only), anti-static vinyl curtains, velometer, and bright fluorescent light. Optional components include magnehelic gage, hour counter, and spill tray. For some applications where ducted laboratory fume hoods are required, our line provides an enclosed workspace to protect the respiratory zone of the operator from inhalation of hazardous fumes and particulate. Certain universities and other laboratories require the use of ducted laboratory fume hoods. The 6” outlet collar connects to external ductwork and fan system to move fumes and particulate from under the hood, through the duct to release outside the building. The ducted laboratory fume hoods come in a wide variety of sizes including 18”, 24”, 30”, 40”, 50”, 60” and 70”. Similar to the ductless units, the duct laboratory fume hoods have an assortment of custom options including material, dimensions, cutouts for sinks and instruments, and multiple work entry configurations. Optional accessories include spill trays, velometer, cleaning products, and a blacklight. It is important to note that the duct laboratory fume hoods do not provide environmental protection and do not filter the air before releasing outdoors. SAS ducted laboratory fume hoods do not include external ductwork and fan but we can help you choose a system for this hood. 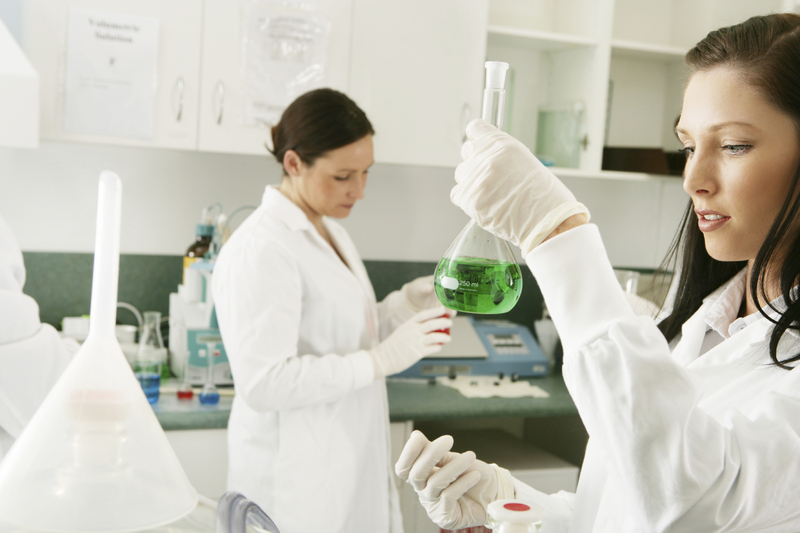 Consult our solutions experts today to help you select a fume hood for your laboratory! 1. “Use of the Laboratory Fume-hood.” University of Wollongong. Apr 2009. https://smah.uow.edu.au/content/groups/public/@web/@sci/@chem/documents/doc/uow059174.pdf. 2. “Attachment A: Particularly Hazardous Substances Definitions.” UCLA Policy 907. https://ehs.ucsc.edu/programs/research-safety/documents/ucla_phs_defn.pdf. 3. “Fume Hood Questions and Answers.” University of Colorado at Boulder: Department of Environmental Health and Safety. 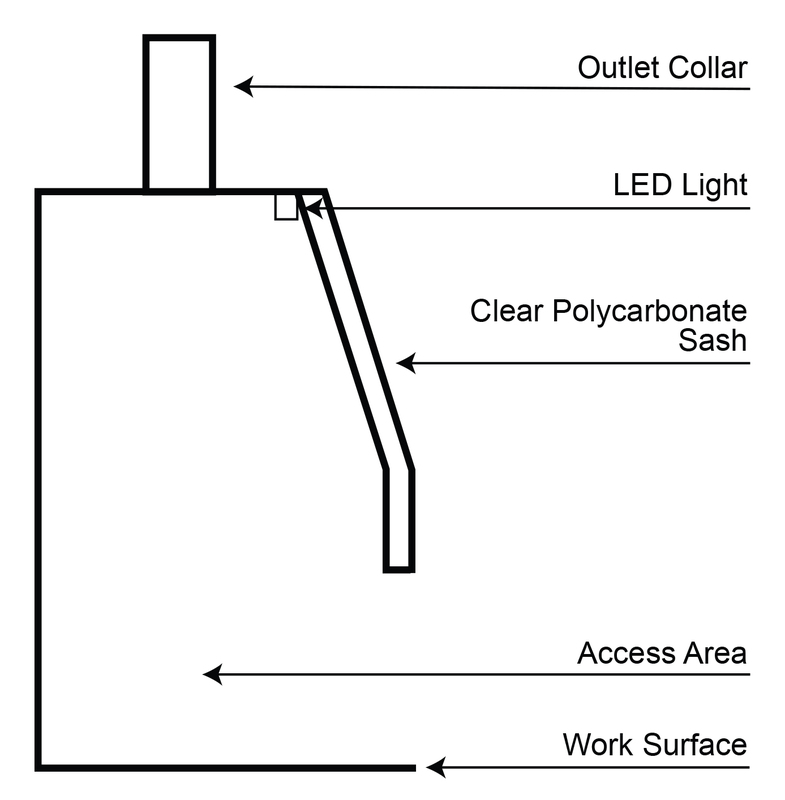 Nov 2008. https://ehs.colorado.edu/wp-content/uploads/2014/11/Fume-Hood-QandA.pdf. 4. “Laboratory Equipment and Engineering Controls.” Princeton University: Environmental Health & Safety. https://ehs.princeton.edu/book/export/html/364. 5. “Chemical Fume Hoods Overview.” UC San Diego. 8 Jun 2018. https://blink.ucsd.edu/safety/research-lab/chemical/hoods/index.html#Learn-more. 6. “Arsine”, “Phosgene”. Centers for Disease Control and Prevention. https://emergency.cdc.gov/. 7. “Ammonia”, “Chloroform”, “Fluorine”, “Formaldehyde”, “Hydrochloric Acid”, “Hydrogen Selenide”, “Hydrogen Sulfide”, “Nitrite”, “Silane”, “Sulfuric Acid”. Pub Chem: US National Library of Medicine. https://pubchem.ncbi.nlm.nih.gov/ . 8. Dean BS. Krenzelok EP. Kurta DL. “Acute Nickel Carbonyl Poisoning.” Am J Erg Med. 1993. https://www.ncbi.nlm.nih.gov/pubmed/8383493. 9. “Isopropyl Alcohol Safety Tips from MSDSonline.” MSDS online. 20 Feb 2015. https://www.msdsonline.com/2015/02/20/isopropyl-alcohol-safety-tips-from-msdsonline/. 10. Occupational Safety and Health Administration. “OSHA Annotated Table Z-1,” https://www.osha.gov/dsg/annotated-pels/tablez-1.html. 11. “Guidelines for the Safe Use of Laboratory Fume Hoods.” Florida International University: Environmental Health & Safety. Oct 2016. https://ehs.fiu.edu/_assets/docs/chemical/fume-hoods-guidelines.pdf.